REMINGTON ‘SPORTSMAN SERIES’ LARGE FIXED BLADE SKINNING KNIFE. Remington ‘Sportsman Series’ Large Fixed Blade Skinning Knife. 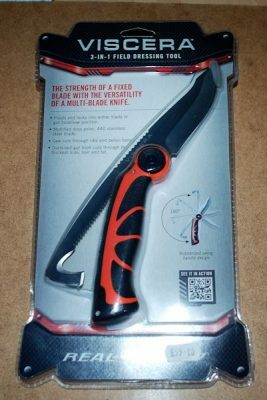 With a Large, Durable, All Weather NONE SLIP handle featuring scalloped finger grips this should offer the maximum possible knife control in any conditions, along with a lanyard hole too. Made from a single piece of 420 J2 Stainless Steel it should prove ideal to keep a keen edge for a good time and the 4 ¾” (115mm) curved blade should make even the toughest hide peel away easily to leave a professional skin as well as carcase. This would also be perfectly usable as a main gralloching / field knife too and comes with a full black leather belt sheath.